This wiki page is a open, living document, so please add your ideas and see also our Github Issue Tracker. Below is a growing list of individual and organizational collaborators. Michelle Thorne (@thornet): Directs the IoT Hub. Drive the hub as an initiative of the Mozilla Leadership Network. Jon Rogers (@ileddigital): Senior research fellow on a sabbatical from the University of Dundee, leveraging his network and expertise to the hub. Create tangible expressions of how things could be, should be and shouldn’t be for IoT. The prototypes will provide the “collaborative substrate” that supports community leaders in learning and making together, while putting our values into action. The prototypes will be grounded in user research and user testing. Internet Adhesives. Explore how to append the internet to everyday objects. This prototype was initiated at the Unbox Caravan in Jan 2016 and further developed and exhibited with The Good Home project in Milan in March. It argues that people shouldn’t have to buy a new object in order to get it talking with the web. It also argues that being able to open and modify an object is an important part of owning it. Mediator Bot. Busy families needs a way to manage their wellbeing to provide them a way to mindfully understanding their day-to-day interactions and behaviours. Can we create something that can help manage how people interact and communicate in the home, by providing a feeling of being in control along with objective intervention and mediation? The solution: A device that seamlessly exists in your room. It monitors and tracks your in-home interactions (through voice and sound) and objectively mediates issues and incidents (through a Family Bot). Flocky Bird. This prototype was developed on February 21, 2016 in collaboration with Junior Lab Berlin. The goal was to create a 3-hour workshop format for children aged 8 - 14 that explore software and hardware in a hands-on way. The workshop creators were interested in collaborative gaming, peer learning, basic computer and web literacy, simple electronics, and ways to bridge the physical world with the web. Gather smart, interdisciplinary practitioners to prototype and innovate with open values. Building prototypes is better, faster, and more impactful when people are together. We want to invite new partners to take action with us–designers, technologists, activists, educators and more–as well as collaborate with Mozillians such as the Connected Devices team, Participation team, and others in the Mozilla Leadership Network. At the National Institute of Design in Ahmedabad, India from Feb 1–13 2016. 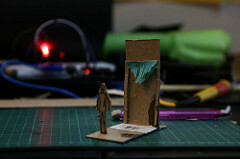 Participants across disciplines of creative technology, design, art, urban planning kicked off projects and collaborations. Hosted by Quicksand's Unbox Labs. The Good Home project explores ideas for 21st century urban living. We are building a pop-up urban living unit for the 21st century. In an on-going series of installments it will explore what life for a technologically-savvy household could look like while they are (and sometimes aren’t) at home in the near future. We will showcase how flexible living interacts with the limitations of diminishing household budgets, limited global resources, evolving concepts of privacy, the sharing economy, and global migration. Hosted by Alexandra Deschamps-Sonsino and Peter Bihr. As part of Mozilla’s exploration of the Internet of Things, we’ll convene leading practitioners from Friday, April 22 - Monday, 25, 2016 to respond to clear design scenarios about how users can understand and control personal data in the connected home. The Berlin design sprint is about making prototypes. Before arriving in Berlin, participants will be given insights based on user research and expert interviews and generate ideas in collaboration with other participants. The time spent in Berlin will be honing these ideas by implementing them in objects and experiences. The goal will be to have several working prototypes that reflect the design scenarios and deepened understanding of what it’s like to build experiences based on user research. Hosted by Michelle Thorne and Jon Rogers at Fablab Berlin. On June 10, 2016 in Amsterdam we’ll discuss what makes a desirable IoT for consumers, citizens, but is equally an arena to do business. How should we think about privacy? What is the user experience for consent? And how do we create a smart city that works for everybody? Expect a Salon where we will discuss ethics in a pragmatic manner, where we learn from each other and foremost work towards a more responsible way to create IoT products. This Salon is hosted by the Just Things Foundation. Participating in the Innovation ideation skill-building sessions and hackathon. As part of Mozilla’s exploration of the Internet of Things, we’ll convene leading practitioners in Anstruther, Scotland from Monday, June 20 - Friday, June 25, 2016 to respond to a clear design brief about how communities can be empowered collectively by using IoT and open practices. The Scottish design sprint is about actively involving communities to explore IoT and make technology alongside them so it fits their lives. A key output will be a collection of ethnographic community publications that exemplify a new way of open source ethnographic design research practice. These will consider privacy, community consent and control, scalability of in-depth research studies, dynamic ethics (how do permissions change over time?) and how can we share research outputs in a useful and shareable, responsible way. September 2-4, 2016 in Berlin, Germany. September 9-11, 2016 in Chattanooga, USA. Hosted by Hive Chattanooga and The Company Lab. September 24-25, 2016 in London, UK. A Tale of Two Cities. Dilemmas in Connected Spaces. Foster partnerships and funding opportunities to grow and sustain the initiative. Insights can be shared that inform future Mozilla efforts. We will leverage and contribute to the larger Mozilla network and document processes in the open so others can learn from and participate in them. Design Scenarios. Research led by Quicksand. Contact us by email at iot @ mozillafoundation . org or in our Github issue tracker. Say hi on Slack and Twitter by pinging Michelle Thorne (@thornet) and Jon Rogers (@ileddigital). This page was last modified on 1 July 2016, at 15:13.